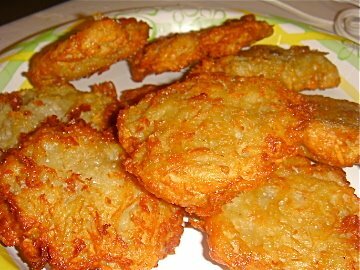 Latkes are potato pancakes traditional to Jewish cuisine, and enjoyed by many many Jews during the festival of Chanukah. They are damn good. Peel and grate the potatoes. Squeeze grated potatoes as hard as you can, removing the starchy water. You could also use a salad spinner. This step is important, removing the moisture & potato starch will improve the texture of your latkes. Grate onion. Beat the eggs, add all the ingredients. Except the fat of course. Then again, if you want to stir a little chicken or duck fat in there, be my guest. Now we fry. How do we fry? Well, let me count the ways. Latkes are traditionally cooked in chicken fat. I say go for it! Seriously, you eat these things once or twice a year, so why not go crazy?! If you opt out of the chicken fat (maybe just mix in a little bit….? ), use vegetable oil. It won’t be quite as amazing, though I suppose your heart will be happier. So, heat whatever fat you like to 360 degrees (the latkes should immediately bubble). Form mix into cakes 3-4 inches across, 1.5 inches thick. Don’t get out a ruler or anything, you’ll get the hang of it! Fry for three minutes per side. Latkes are also a great candidate for deep frying. 4 minutes in the fryer will do it! *Don’t be alarmed if the latke mixture changes color. It’s just the potato oxidizing. Removing the potato water will help stop this, as will the egg. Keeping it covered helps, too. Still, your mix will turn brown, maybe even grey. Don’t stress it. It’s cosmetic, and the beautiful golden brown crust that forms when you fry will make it disappear.